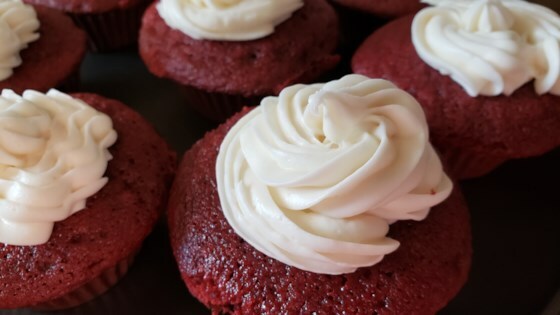 "This mini version of the classic Red Velvet Cake is one of the more popular offerings in bakeries all across the country. Whip up a batch this holiday season or anytime of the year." Bake 20 minutes or until toothpick inserted into cupcake comes out clean. Cool in pans on wire rack 5 minutes. Remove from pans; cool completely. Frost with Vanilla Cream Cheese Frosting. Vanilla Cream Cheese Frosting: Beat cream cheese, softened, butter, sour cream and McCormick(R) Pure Vanilla Extract in large bowl until light and fluffy. Gradually beat in confectioners' sugar until smooth. See how to make a classic chocolate cake in delicious cupcake form. FABULOUS!!! Fast and super-duper easy. I'm eleven and I made these and they tasted FANTASTIC! Got compliments all day. These were great! Didnt change a thing. I would make these again. The recipe yielded more than 30 perfect sized cup cakes.